In 1991, the maple industry in Quebec went through difficult moments, affecting dramatically the maple division of IPL Inc., leader in the Canadian plastic industry in St-Damien-de-Buckland, Qc. A business opportunity presented itself for one of its employees, Christian Chabot – The best sales representative of the division, for the purchase of marketing activities in this rather neglected division. He proceeded to create “CDL Maple Sugaring Equipment Inc.”, located in St-Lazare-de-Bellechasse, Québec, along with another employee and an IPL customer. Together, they negotiated the acquisition of the department specialized in the manufacturing of tubing and fittings used in the installation of vacuum systems (Sysvac) for the maple industry. Following the transfer of IPL’s assets to the new company, an argument arose between the shareholders about the location of the main office. Therefore, the new company did not become operational during the first six months of its existence. One of the partners, Christian Chabot, chose to withdraw and team-up with his two brothers, Jean-Marie and Ivan to get things going. Jean-Marie Chabot, a mechanical engineer, director of R&D at IPL and head of development for the maple division was already renowned in 1970 as one of the pioneers in the field of vacuum systems in the maple industry. Most of his work had been done in collaboration with Laval University – Québec and with the Ministry of Agriculture of Québec (Experimental Farm St-Norbert). In 1971, he tested the performance of these innovations in his own 5000 tap bush, located in Armagh – QC, before making them available to maple syrup producers everywhere. The third CDL owner, Yvan Chabot, had previously been employed by the Federated Cooperative of Québec, as an accounting and finance manager, serving farmers. The expertise of these three owners was perfect to ensure a smooth start. The new CDL headquarters was ready in 1991. In 1994, the acquisition of Dallaire Evaporators from St-Evariste-de-Beauce, specializing in the production of stainless steel tanks and evaporators. In 2009, a major fire completely destroyed the plant. A new larger building was built a few miles away from the old one, with state of the art production equipment and a large retail store. In 1999, to meet the ever increasing demand in the Bas-St-Laurent and New Brunswick, the company inaugurated its first distribution center; CDL-Cabano was born. This new facility allowed CDL to better serve customers in these remote areas. 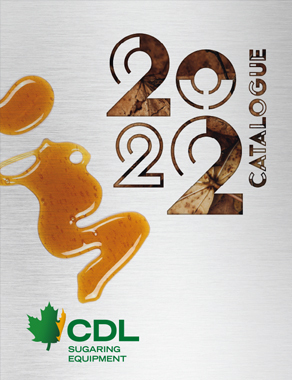 In the early 2000’s, to keep up with the incredible growth of the maple sugaring industry, CDL moved into a much larger building with offices, a new machining center equipped with the latest technologies in digital control and computer-aided design (CAD) for the production of stainless steel parts, a new building for much larger headquarters, a retail store, an assembly department and a central warehouse. All of this, to be able to meet the growing needs of the employees, customers, and the expanding range in CDL maple products. In 2005, CDL wanted to increase its presence in the United States. To do so, CDL purchased Waterloo Small USA from St-Albans, Vermont, better known as Maple Pro. In Canada: CDL Shefford, CDL St-Adalbert, CDL Warwick, CDL Portneuf, Équipements d’Érablière Guy Maheux (Beauce), CDL Central Ontario, CDL Western and CDL Lanark (Ontario). A Canadian sales force, made of 23 CDL representatives and 9 independent distributors, complete the distribution network for products across Québec, Ontario and New-Brunswick. United States: CDL Michigan, CDL Pennsylvania, CDL Vermont (4) and CDL Wisconsin. An American sales force, made of 5 CDL representatives and 40 independent distributors, complete the distribution network for products across the 10 states served.